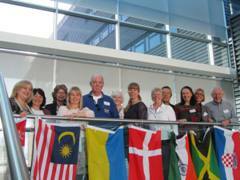 The 2014 autumn Board meeting of EFPTA was held on Saturday 25 October in Edinburgh, Scotland. Psychology staff within the School of Life, Sport and Social Sciences at Edinburgh Napier University hosted the meeting. As well as the Board members, several members of the UK teachers' association (ATP) were welcomed as observers; every member of EFPTA's member associations is eligible to attend Board meetings. Look out for further information on the spring 2015 Board meeting, which is to be held in Brussels in April.